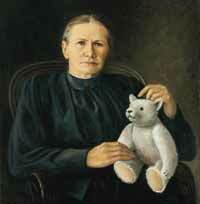 Steiff was founded by Margarete Steiff, who was born July 24th,1847. She became ill with polio at the age of one and was confined to a wheelchair. Despite her illness, Margarete Steiff never stopped enjoying life. In 1877, Margarete began to sell garments and household items that she made herself. In 1880 she created the first Steiff animal which was an elephant made of felt. Within a few years the young business woman offered a whole menagerie of animals in felt including monkeys, donkeys, horses, camels, giraffes, pigs, mice,dogs and cats. Later other Steiff family members joined and expanded the company. The concept of the "Teddy Bear" and the classic Steiff "Button In Ear" trademark were established. Today, Steiff has the distinction of being the oldest continuously operating toymaker in the world and recently celebrated the company's 125th anniversary.